How do I find quantitative research studies in CINAHL? - Ask Us! Q. How do I find quantitative research studies in CINAHL? I'm doing a project and need to find primary research on women's health issues. There is no one way to limit to quantitative studies in CINAHL, but there are several strategies to try. Be sure to review the methods of the studies you find to be sure that they are quantitative. 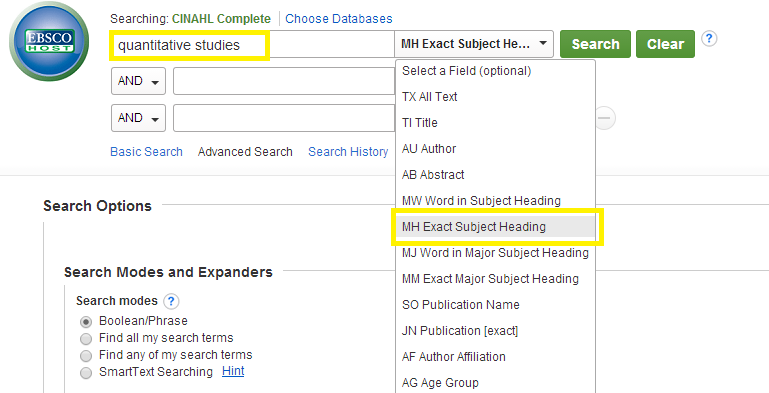 Search Strategy One: ‘Quantitative studies’ is a subject heading in CINAHL. Enter ‘quantitative studies’ into the search box, along with your topic keywords, and change the drop-down menu to ‘MH Exact Subject Heading.’ This may not retrieve all of the quantitative studies available, but it is one strategy to use. Search Strategy Two: Limit your search to Randomized Controlled Trials. Search Strategy Three: Limit your search by Publication Type to those that are likely to include quantitative methods such as: Clinical Trial, RCT, Meta-Analysis, Statistics,Tables/Charts. Be sure to review the methods of the articles you find to ensure they are quantitative.